High-mobility group box 1 protein (HMGB1) has been studied as a key mediator of inflammatory diseases, including sepsis. Regulating secretion is important in the control of HMGB1-mediated inflammation. Previously, it was shown that HMGB1 needs to be phosphorylated for secretion. In this study, we show that HMGB1 is phosphorylated by the classical protein kinase C (cPKC) and is secreted by a calcium-dependent mechanism. For this study, RAW264.7 cells and human peripheral blood monocytes were treated with PI3K inhibitors wortmannin, LY294002, and ZSTK474, resulting in inhibition of LPS-stimulated HMGB1 secretion, whereas inhibitors of NF-κB and MAPKs p38 and ERK showed no inhibition. Akt inhibitor IV and mammalian target of rapamycin inhibitor rapamycin did not inhibit HMGB1 secretion. However, the PKC inhibitors Gö6983 (broad-spectrum PKC), Gö6976 (cPKC), and Ro-31-7549 (cPKC) and phosphoinositide-dependent kinase 1 inhibitor, which results in protein kinase C (PKC) inhibition, inhibited LPS-stimulated HMGB1 secretion. PKC activators, PMA and bryostatin-1, enhanced HMGB1 secretion. In an in vitro kinase assay, HMGB1 was phosphorylated by recombinant cPKC and by purified nuclear cPKC from LPS-stimulated RAW264.7 cells, but not by casein kinase II or cdc2. HMGB1 secretion was also induced by the calcium ionophore A23187 and inhibited by the Ca2+ chelators BAPTA-AM and EGTA. These findings support a role for Ca2+-dependent PKC in HMGB1 secretion. Thus, we propose that cPKC is an effector kinase of HMGB1 phosphorylation in LPS-stimulated monocytes and PI3K-phosphoinositide-dependent kinase 1 may act in concert to control HMGB1 secretion independent of the NF-κB, p38, and ERK pathways. High-mobility group box 1 (HMGB1)4 protein is a nuclear protein that was recently found to trigger inflammation, including sepsis (1, 2). Furthermore, HMGB1 can bind to LPS (3) and IL-1 (4) and synergize the inflammatory response. HMGB1 is passively released by necrotic cells, but not by apoptotic cells, and is actively released from activated monocytes and macrophages (2, 5) after proinflammatory stimuli, such as LPS, TNF-α, IL-1, IL-6, and IL-8 (6), and the modification of HMGB1 by phosphorylation (7) and acetylation (5). Thus, the regulation of secretion is important in the control of HMGB1-mediated inflammation, but the secretion mechanism is poorly understood. It was previously shown that the shuttling of HMGB1 between the nucleus and the cytoplasm is tightly controlled by the phosphorylation of the two nuclear localization signals (NLS) of HMGB1 (7). 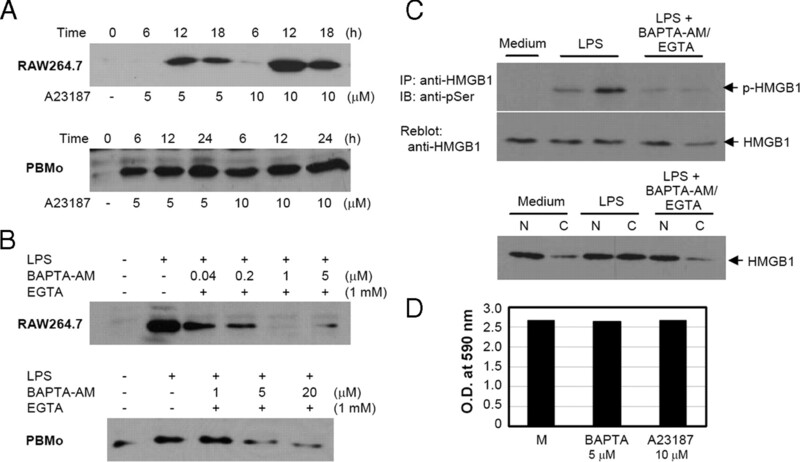 When HMGB1 is phosphorylated, nuclear HMGB1 is translocated to the cytoplasm and cytoplasmic HMGB1 reduces its binding to the nuclear cargo carrier protein of karyopherin-α1 (7), resulting in the eventual secretion of HMGB1 into the extracellular space. However, the kinase enzyme for HMGB1 phosphorylation has not been identified. When LPS is introduced into the circulation, it binds to LPS-binding molecules such as LPS-binding protein (8) or HMGB1 (3) and is transferred to CD14 and then the TLR4-MD2 receptor to initiate LPS-mediated signaling (9). LPS signaling in human monocytes involves the IκB kinase-NF-κB pathway and activates numerous protein kinases, including MAPKs (p38, ERK, and JNK) and PI3K (for review, See Refs. 10 and 11). However, it is controversial whether the effect of the PI3K-Akt pathway in LPS signaling positively or negatively affects the inflammatory response (12, 13, 14). The prominent target of PI3K is phosphoinositide-dependent kinase 1 (PDK1), which regulates protein kinase B (Akt) (15, 16), p70s6k (17), and protein kinase C (PKC) (18, 19). PKC is a family of serine/threonine enzymes and plays an important role in many signal pathways, including those involved in inflammation (for review, see Refs. 20 and 21). PKC has many isoenzymes classified into three subgroups: calcium- and diacylglycerol (DAG)-dependent classical PKC (cPKC; α, βI, βII, and γ), calcium-independent and DAG-dependent novel PKC (nPKC; δ, ε, η, and θ), and calcium- and DAG-independent atypical PKC (ζ and λ). In the present report, we sought to determine which effector kinase is involved in HMGB1 phosphorylation associated with secretion. We tested various inhibitors of LPS-stimulated signal pathways to identify the pathway regulating HMGB1 secretion. We show that the inhibitions of cPKC and the upstream kinases PDK1 and PI3K reduced LPS-stimulated HMGB1 secretion in RAW264.7 cells and human peripheral blood monocytes (PBMo). We also determined that calcium is important for the secretion of HMGB1. Our in vitro kinase assay revealed that cPKC is the effector kinase of HMGB1 phosphorylation that is necessary for secretion. Murine macrophage RAW264.7 cells (American Type Culture Collection) and human peripheral blood monocytes (PBMo) were cultured at 37°C under 5% CO2 in DMEM supplemented with 10% FBS (Life Technologies), 100 U/ml penicillin, 100 μg/ml streptomycin, and 2 mM l-glutamine. Human PBMo cells were harvested from the adhesive cells on the culture flask as previously described after obtaining the permission of the institutional review board. Six His-tagged wild-type (WT) HMGB1 and HMGB1 NLS1/2A proteins were purified from Escherichia coli BL21 (DE3) pLysE using Ni2+-NTA, Sephadex G75, and ion-exchange columns (7). HMGB1 NLS1/2A is a mutant protein in which the phosphorylation candidate sites at serines 35, 39, 42, 46, and 53 within or close to NLS1 and serine 181 within NLS2 are mutated into alanine (7). To analyze the amount of HMGB1 secretion in the supernatant, we performed a Western blot analysis as previously described (7). Briefly, RAW264.7 and human PBMo cells were replaced with serum-free OPTI-MEM medium (Invitrogen) and pretreated with each signal pathway inhibitor (see below) for 1 h before LPS treatment and incubated for another 20 h in the presence of 1 μg/ml LPS (E. coli 0111:B4; Sigma-Aldrich). The culture supernatants were concentrated with Amicon Centricon filtration (Millipore) after removing cell debris. The protein samples were analyzed on 12% SDS-PAGE. Rabbit anti-HMGB1 (Abcam) and HRP-labeled goat anti-rabbit Ig (Sigma-Aldrich) were used as primary and secondary Abs, respectively, for Western blotting. The signals were revealed with ECL (Labfrontier). To observe which signaling pathway is involved in HMGB1 secretion, we used inhibitors of NF-κB, MAPKs, PI3K, and downstream pathways. The NF-κB inhibitors SN50 and BAY 11-7082 (BAY-11) and the MAPK inhibitors SB203580 (p38 inhibitor), PD098059 (ERK1/2 inhibitor), and SP600125 (JNK inhibitor) were purchased from Calbiochem. We used wortmannin (Calbiochem), LY294002 (A.G. Scientific), and ZSTK474 (Alexis) for PI3K inhibition, Akt inhibitor IV (Merck) for Akt inhibition, rapamycin (Cell Signaling) for mammalian target of rapamycin (mTOR), OSU03012 for PDK1, Gö6983 for broad-spectrum PKC (22), Gö6976 for PKCα and βI (23) and Ro-31-7549 for PKCα, βI, βII, γ, and ε (24) (all from Calbiochem). ZSTK474 is a highly specific PI3K inhibitor with 20-fold greater activity than LY294002 (25). RAW264.7 cells were treated with PMA (Sigma-Aldrich) for 18 h and bryostatin-1 (Calbiochem) for 20 h to activate cPKC and nPKC (26, 27). To observe the effect of intracellular calcium on HMGB1 secretion, the cells were treated with the calcium ionophore A23187 (Sigma-Aldrich) for 30 min to increase the calcium level in tyroid buffer (137 mM NaCl, 2.7 mM KCl, 1.8 mM CaCl2, 1.1 mM MgCl2, 11.9 mM NaHCO3, 0.4 mM NaH2PO4, and 5.6 mM glucose, pH 7.2) and then incubated with fresh culture medium in the absence of A23187 for the indicated times. To block intracellular calcium signaling, the cells were pretreated with a mixture of BAPTA-AM (Calbiochem) and EGTA 1 h before LPS treatment and then further incubated for 18 h in the presence of LPS. A MTT (Sigma-Aldrich) cytotoxicity assay was performed for each inhibitor before treatment to exclude the possibility of HMGB1 release by cell necrosis. For this, 2 × 104 cells/well of RAW264.7 were cultured in 96-well plates and treated with each inhibitor for 20 h. MTT (Sigma-Aldrich) was treated for an additional 4 h at 1 mg/ml. The precipitate was solubilized with DMSO after discarding the supernatant. OD was measured at 570 nm. To investigate the effector kinase that is involved in HMGB1 phosphorylation, we performed an in vitro protein kinase assay. For the assay, we incubated 2 μg of WT HMGB1 and HMGB1 NLS1/2A proteins with 20 ng of recombinant cPKC mixture (isoenzymes α, β, and γ; Upstate Biotechnology) and 5 μCi [γ-32P]ATP (Amersham Pharmacia Biotech) in a total volume of 30 μl of buffer, which was composed of assay dilution buffer II (20 mM MOPS (pH 7.2), 25 mM β-glycerophosphate, 1 mM sodium orthovanadate, 1 mM DTT, and 1 mM CaCl2), lipid activator (10 μM PMA and 0.28 mg/ml phosphatidylserine in a 0.3% Triton X-100 mixed micelle suspension), PKA/CAMK inhibitor mixture (Upstate Biotechnology), 75 μM ATP, and 10 mM MgCl2 for PKC reaction. For the casein kinase II (CK II) reaction, 500 U of CK II (NEB) was used in the buffer, which was composed of 20 mM Tris-HCl (pH 7.5), 50 mM KCl, 10 mM MgCl2, and 50 μM ATP. For the cdc2 reaction, 20 U of cdc2 (NEB) was used in the buffer, which was composed of 20 mM Tris-HCl (pH 7.5), 10 mM MgCl2, 1 mM EGTA, 2 mM DTT, and 50 μM ATP. All of the reactions were performed at 30°C for 30 min and terminated by adding 5× sample buffer. The samples were separated with 12% SDS-PAGE and autoradiography was performed after drying. To observe the dose-dependent change in HMGB1 phosphorylation, we incubated various amounts of HMGB1 protein with a constant amount of cPKC in the presence of [γ-32P]ATP. The mixtures were transferred to p81 phosphocellulose squares (Upstate Biotechnology) followed by washing twice with 0.75% phosphoric acid and once with acetone. Then, we determined the cpm with a beta scintillation counter (Beckman Coulter). Next, to investigate whether HMGB1 phosphorylation is specific to cPKC, we performed an in vitro kinase assay with HMGB1 and cPKC in the presence of various amounts of Gö6983 and then we measured the cpm. The in vitro kinase assay was also performed using cPKC purified from the nuclear extracts of RAW264.7 cells. To prepare nuclear cPKC from RAW264.7 cells, the nuclear fraction was collected using a nuclear extract kit (Active Motif). The nuclear pellet was lysed in lysis buffer (20 mM HEPES, 25% glycerol, 5 mM MgCl2, 1 mM CaCl2, 2 mM DTT, and 100 mM NaCl) and then resuspended by at least 30 strokes with a Dounce homogenizer. The purity of the nuclear protein was tested by probing a Western blot for α-tubulin. The extract was centrifuged at 13,000 rpm for 30 min at 4°C and precleared by incubation with 20 μl of protein G-Sepharose (Amersham Biosciences) for 1 h at 4°C on a rocker. We incubated 1 mg of the nuclear lysate protein with 5 μg of anti-cPKC Ab for 2 h at 4°C and then added protein G-Sepharose and incubated the mixture overnight at 4°C. The immune complexes were washed with MOPS buffer (20 mM MOPS (pH 7.2), 1 mM Na3VO4, 0.5 mM DTT, 10 mM MgCl2, 1 mM CaCl2, 10 mM NaF, 1 μg/ml aprotinin, 1 μg/ml leupeptin, and 1 μg/ml pepstatin A) and an in vitro kinase assay was performed as described above. Each PKCα, β, and γ isoenzyme was purified from the whole cell lysates of RAW264.7 for the in vitro kinase assay. RAW264.7 cells were treated with Nonidet P-40 lysis buffer (20 mM Tris-HCl (pH 7.6), 2 mM EDTA, 1 mM PMSF, 0.5 mM DTT, 1 mM Na3VO4, 10 mM NaF, 150 mM NaCl, 1% Nonidet P-40, 1 μg/ml aprotinin, 1 μg/ml leupeptin, and 1 μg/ml pepstatin A) for 30 min at 4°C. The lysates were precleared by incubation with protein G-Sepharose. Three milligrams of whole cell lysate protein was incubated with 1 μg of each mAb to PKCα, PKCβ, and PKCγ (BD Biosciences) for 2 h at 4°C and then immunoprecipitated with protein G-Sepharose for 1.5 h at 4°C for an in vitro kinase assay. To investigate the effect of PDK1 on the secretion of HMGB1, a PDK1-specific shRNA construct was used to knockdown PDK1 expression. RAW264.7 cells in 24-well culture plates were transfected with 1–5 μg of HuSH 29-mer PDK1 shRNA plasmid (OriGene Technologies; CTGCGGCAAGAGTTGCCTGTCAGACTGGC) containing puromycin selection marker using FuGENE 6 (28). The transfected cells were selected for 24 h by addition of 1 μg/ml puromycin after transfection. Mock shRNA (OriGene Technologies) was also used for the control. Puromycin-selected RAW264.7 cells were treated with 1 μg/ml LPS for the indicated time. The culture supernatants were prepared for SDS-PAGE to observe HMGB1 secretion, and whole cell lysates (10 μg) were resolved to observe the knockdown of PDK1 protein. PDK1 expression ranging from 58 to 68 kDa was tested using anti-PDK1 Ab (Upstate Biotechnology). Anti-GAPDH Ab (Lab Frontier) was used for the loading control. To observe the interaction between PDK1 and PKC, RAW264.7 cells were transfected with PDK1 shRNA and selected with puromycin for 24 h. Puromycin-selected cells were treated with 1 μg/ml LPS for ∼16 h and whole cell lysates were analyzed to observe the phosphorylation of PKC. Anti-phospho-panPKC Ab (Cell Signaling), which detects endogenous phosphorylation of PKCα, βI, βII, δ, ε, η, and θ isoforms at a carboxyl-terminal residue, was used to detect PKC activation. To observe the translocation of cPKC and HMGB1 proteins in the RAW264.7 cells after LPS treatment, we used immunofluorescence staining. The RAW264.7 cells were cultured in LabTek II chambers (Nalgene) and treated with 1 μg/ml LPS for the indicated times. The cells were fixed in 3.7% paraformaldehyde-PHEM buffer (60 mM PIPES, 25 mM HEPES, 10 mM EGTA, and 4 mM MgSO4, pH 7.0) for 20 min at room temperature (RT). After fixation, the cells were washed with cold PBS and incubated for 5 min at 4°C with HEPES-based permeabilization buffer containing 10 mM PIPES, 0.5% Triton X-100, 300 mM sucrose, 100 mM NaCl, 3 mM MgCl2, 1 mM EGTA, and 1 mM PMSF. The cells were blocked with 1% BSA in PBS for 20 min after washing and were incubated with rabbit anti-HMGB1 and mouse monoclonal anti-cPKC Abs for 2 h at RT. After three washes, Alexa Fluor 488-conjugated goat anti-rabbit Ig (Invitrogen) and Alexa Fluor 594-conjugated donkey anti-mouse IgG (Invitrogen) were added and incubated for 1 h at RT. All staining was performed at the same time. After mounting with 4′,6-diamidino-2-phenylindole, the cells were observed with a confocal LSM 510 microscope (Zeiss) and the mean fluorescence intensity of >10 nuclei was measured. RAW264.7 cells were treated with 1 μg/ml LPS for the indicated time and the nuclear extracts were harvested as described above. The nuclear extract (500 μg) was incubated overnight with 2 μg of anti-HMGB1 in the presence of 20 μl of 50% (v/v) protein G-Sepharose at 4°C. After three washes with PBS, the precipitated complexes were solubilized by boiling in SDS buffer. Western blotting was performed using anti-PKCα and anti-PKCγ. The membrane was reblotted with anti-HMGB1. To investigate whether LPS-stimulated phosphorylation of HMGB1 is inhibited by PKC inhibitor or calcium chelators, RAW264.7 cells were pretreated with 5 μM Gö6983 or 5 μM BAPTA-AM plus 1 mM EGTA and then treated with 1 μg/ml LPS for 16 h. Whole cell lysates were prepared and immunoprecipitated with anti-HMGB1 Ab and reblotted with anti-phospho-Ser (pSer) PKC substrate Ab (Cell Signaling). To observe whether LPS-stimulated migration of nuclear HMGB1 into the cytoplasm is impaired by the above treatments, nuclear and cytoplasmic subcellular fractions were prepared using a Qproteome Cell Compartment kit (Qiagen) and HMGB1 was detected by Western blotting using anti-HMGB1 Ab. In this study, we observed HMGB1 secretion in RAW264.7 and human PBMo cells using various inhibitors of the LPS-stimulated signal pathway to understand the relationship between phosphorylation and secretion of HMGB1 (7). First, we looked at the effect of the NF-κB inhibitors SN50 and BAY-11 on HMGB1 secretion. Both inhibitors affect different processes; SN50 inhibits the translocation of NF-κB into the nucleus and BAY-11 inhibits IκB phosphorylation, resulting in decreased expression of free NF-κB. RAW264.7 cells were pretreated with each inhibitor for 1 h and further incubated for 20 h in the presence of 1 μg/ml LPS. HMGB1 secretion in the culture supernatants was not decreased by either of the NF-κB inhibitors (Fig. 1⇓A). Secretion of HMGB1 is reduced by inhibitors of PI3K, but not of NF-κB and the MAPKs p38, ERK, and JNK. RAW264.7 and human PBMo cells were pretreated for 60 min with various amounts of the inhibitors SN50 and BAY-11 for NF-κB (A), SB203580 for p38, PD098059 for ERK1/2, and SP600125 for JNK (B) and wortmannin, LY294002, and ZSTK474 for PI3K (C-1 and C-2), and then treated with 1 μg/ml LPS for 20 h. The culture supernatants were harvested and Western blot analyses were performed to measure HMGB1 secretion. All of the tests were repeated at least two or three times depending on the experiment. The dot line indicates the cut line of the same blot membrane. D, MTT assay data are shown at the maximum treatment concentration of each inhibitor using RAW264.7 cells. M, Medium; SB20, SB203580; PD98, PD98059; SP60, SP600125; Wort, wortmannin; LY29, LY294002. We next tested the involvement of three MAPK pathways using SB203580 (p38 inhibitor), PD098059 (ERK1/2 inhibitor), and SP600125 (JNK inhibitor). SB203580 and PD098059 showed no effect on HMGB1 secretion, but SP600125 inhibited LPS-stimulated HMGB1 secretion in RAW264.7 cells (Fig. 1⇑B), confirming the previous results (29, 30). We also tested the involvement of PI3K and its related pathways in HMGB1 secretion, since LPS treatment rapidly influences PI3K in both RAW264.7 and human PBMo cells (31, 32). When RAW264.7 cells were treated with wortmannin, LY294002, and ZSTK474, a highly specific PI3K class IA and IB inhibitor (25), LPS-stimulated HMGB1 secretion was decreased in a dose-dependent manner by these inhibitors (Fig. 1⇑C-1). This inhibition was also observed in human PBMo cells (Fig. 1⇑C-2), suggesting that PI3K is involved in LPS-stimulated HMGB1 secretion. The MTT assay data of each inhibitor (Fig. 1⇑D) and the background level of HMGB1 secretion by treatment of the inhibitor alone showed that these results were not due to necrotic RAW264.7 cells by the inhibitors. Next, we treated RAW264.7 cells with Akt inhibitor IV to further investigate the involvement of Akt, the downstream molecule of PI3K, since Akt functions in concert with PI3K to block LPS-stimulated NO production (32). HMGB1 secretion, however, was not reduced by Akt inhibition (Fig. 2⇓A). When rapamycin was used to inhibit mTOR, the downstream target of Akt that has been shown to have in vivo protein kinase activity (33, 34), HMGB1 secretion was not reduced in the RAW264.7 cells (Fig. 2⇓A). This finding suggests that LPS-stimulated secretion of HMGB1 is related to PI3K, but not to Akt-dependent pathways. Secretion of HMGB1 is related to PKC. A and B, RAW264.7 cells were pretreated with the downstream inhibitors of PI3K: Akt inhibitor IV and rapamycin for Akt and mTOR inhibition, respectively. The secreted HMGB1 in the culture supernatants was measured. B-1 and B-2, RAW264.7 and human PBMo cells were pretreated with Gö6983, Gö6976, and Ro-31-7549, and LPS-stimulated HMGB1 secretion was measured. The dot line indicates the cut line of the same blot membrane. C, RAW264.7 cells were treated with PMA and bryostatin-1 in the absence of LPS for 18–20 h and HMGB1 in the culture supernatant was measured. All of the tests were repeated at least two or three times depending on the experiment. D, MTT assay data are shown at the maximum treatment concentration of each inhibitor. Akt IV, Akt inhibitor IV; Rapa, rapamycin; Ro-31, Ro-31-7549. We treated RAW264.7 cells with a broad-spectrum PKC inhibitor, Gö6983, to investigate the involvement of PKC (22). 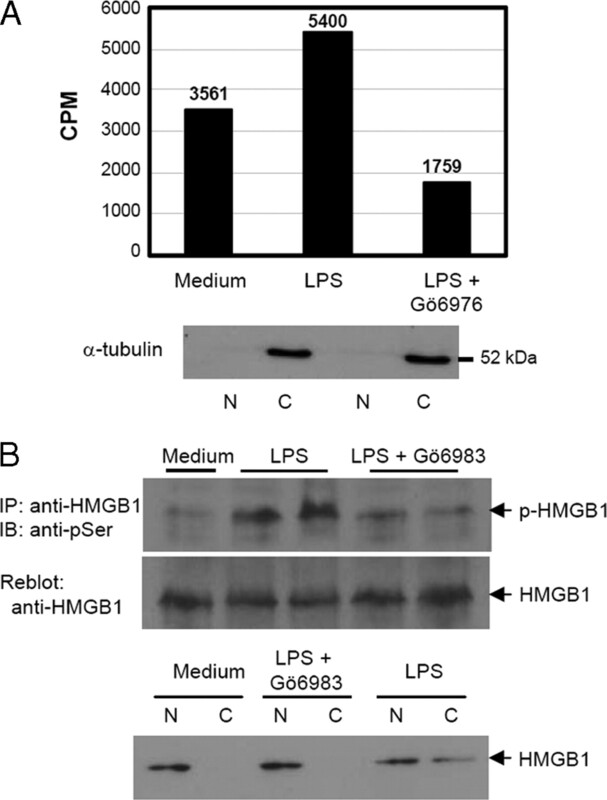 Gö6983 inhibited LPS-stimulated HMGB1 secretion in a dose-dependent manner (Fig. 2⇑B-1). When RAW264.7 cells were treated with Gö6976, a selective inhibitor of PKCα, βI (23), HMGB1 secretion was inhibited. Ro-31-7549, another selective cPKCα, βI, βII, γ, and ε inhibitor (24), also inhibited HMGB1 secretion in RAW264.7 cells (Fig. 2⇑B-1). When human PBMo cells were treated with Gö6983, Gö6976, and Ro-31-7549, HMGB1 secretions were similarly reduced by each of these inhibitors in a dose-dependent manner (Fig. 2⇑B-2). The MTT cytotoxicity assay data of inhibitors are shown in Fig. 2⇑D. To further investigate the involvement of PKC, we activated PKC and measured the HMGB1 secretion in RAW264.7 cells. For this experiment, RAW264.7 cells were treated with PMA, a tumor-promoting phorbol ester, in the absence of LPS. PMA (also called 12-O-tetradecanoylphorbol-13-acetate) (35) is a surrogate of DAG and activates the cPKC and nPKC isoenzymes. HMGB1 secretion was increased in a dose-dependent manner with PMA treatment (Fig. 2⇑C). When RAW264.7 cells were treated with another PKC activator, bryostatin-1, which is a macrocyclic lactone that activates cPKC and nPKC activity (36, 37, 38), HMGB1 secretion was slightly increased in a dose-dependent manner (Fig. 2⇑C). Because the up-regulated PKC activity by bryostatin-1 is rapidly down-regulated (36, 37, 38), the increment of HMGB1 secretion seemed to be slight. These results suggest that PKC, specifically cPKC, is important in LPS-stimulated HMGB1 secretion. PDK1 is another downstream target of PI3K that regulates many PKC isoenzymes such as PKCα, βI, δ, ε, ζ, and λ (18, 19). When RAW264.7 cells were treated with the PDK1 inhibitor OSU03012, the secretion of HMGB1 was reduced in a dose-dependent manner (Fig. 3⇓A). Next, we used a PDK1-specific shRNA construct to knockdown PDK1 expression. PDK1 expression was suppressed efficiently by the PDK1 shRNA2 construct (Fig. 3⇓B). HMGB1 secretion was not induced by LPS treatment in PDK1 shRNA-transfected RAW264.7 cells, while HMGB1 secretion was induced 16 h after LPS treatment in mock shRNA-transfected RAW264.7 cells (Fig. 3⇓, C-1 and C-2), confirming the involvement of PDK1 on HMGB1 secretion. To investigate whether the influence of PDK1 on HMGB1 secretion is mediated by PKC expression, PKC expression was measured in PDK1 shRNA-transfected RAW264.7 cells. When RAW264.7 cells were treated with LPS, endogenous phosphorylation of PKC isoforms, ∼80 kDa (39), could be observed (Fig. 3⇓D, upper). LPS-stimulated PKC phosphorylation, however, was inhibited when PDK1 expression was knocked down by shRNA transfection (Fig. 3⇓D, lower). These results suggest that PDK1 knockdown by shRNA efficiently suppressed LPS-stimulated PKC expression. PDK1 is involved in HMGB1 secretion. A, RAW264.7 cells were pretreated with OSU03012 and the secretion of HMGB1 in response to LPS was measured in the culture supernatants. B, RAW264.7 cells were transfected with PDK1 shRNA constructs and selected with 1 μg/ml puromycin for 24 h. PDK1 protein expression was measured by Western blotting. GAPDH was for loading control. C-1 and C-2, RAW264.7 cells were transfected with PDK1 shRNA2 or mock construct; LPS (1 μg/ml) was treated for the indicated time after puromycin selection. The culture supernatants were resolved by SDS-PAGE to observe HMGB1 secretion and whole cell lysates were resolved to observe the knockdown of PDK1 protein. The dotted line indicates the cut line of the same blot membrane. D, RAW264.7 cells were treated with LPS for the indicated time, and PKC phosphorylation was measured in whole cell lysates by Western blot analysis using anti-phospho-panPKC Ab. To observe the effect of PDK1 on PKC activation, RAW264.7 cells were transfected with PDK1 shRNAs or mock shRNA and selected with puromycin for 24 h. Puromycin-selected cells were treated with 1 μg/ml LPS and whole cell lysates were resolved for phospho-PKC. The membrane was reblotted with PDK1 and GAPDH. To further examine whether cPKC is directly involved in HMGB1 phosphorylation, we performed an in vitro kinase assay. For this assay, we tested a mixture of cPKC isoenzymes (α, β, and γ) and two other serine/threonine-specific protein kinases, CK II and cdc2. CK II and cdc2 enzymes were included because they have been reported to phosphorylate HMG-I, a HMG family protein (40, 41, 42, 43). We used the same amounts of WT HMGB1 and mutant HMGB1 NLS1/2A proteins as the substrate proteins (Fig. 4⇓A). As shown in Fig. 4⇓B, HMGB1 WT was heavily phosphorylated by cPKC and detected as a band at the correct molecular weight for HMGB1. HMGB1 NLS1/2A protein, however, was present in severely diminished or only traceable levels. CK II and cdc2, however, did not show phosphorylation of either WT or mutant HMGB1 proteins, although the phosphorylation of different molecular mass proteins that may have originated from E. coli were present. In vitro kinase assay of HMGB1 phosphorylation. A, Amino acid sequence map of WT and NLS1/2A mutant HMGB1 proteins. B, WT and NLS1/2A mutant HMGB1 proteins were produced in E. coli and in vitro kinase assays were performed using cPKC, CK II, and cdc2 enzymes. Both proteins were analyzed with 12% SDS-PAGE and autoradiography was performed. C, An in vitro kinase assay of HMGB1 using cPKC was performed by incubating various amounts of HMGB1 with a constant amount of cPKC. The phosphorylation levels were analyzed by autoradiography and a beta scintillation counter. D, The mixtures of HMGB1 and cPKC were incubated with various amounts of Gö6983 and the phosphorylation levels were analyzed. The data in C and D are from separate studies. Next, an in vitro kinase assay using cPKC was performed with various amounts of WT HMGB1 protein. HMGB1 phosphorylation could be observed in a dose-dependent manner by autoradiography (Fig. 4⇑C, upper). And the radioactivities of the phosphorylated HMGB1 were also increased with increasing amounts of HMGB1 by a beta scintillation counting assay (Fig. 4⇑C, lower). Furthermore, the phosphorylation of HMGB1 was decreased by the addition of Gö6983 (Fig. 4⇑D, upper and lower), demonstrating that cPKC is directly involved in HMGB1 phosphorylation. HMGB1 is a nuclear protein that must be phosphorylated in the nucleus to translocate to the cytoplasm for eventual secretion into the extracellular space after LPS stimulation. To investigate whether HMGB1 is phosphorylated in the nucleus, RAW264.7 cells were treated with LPS for various times and the nuclear translocation of cPKC isoenzymes from the cytoplasm was observed using a confocal microscope. In the medium-alone treatment, cPKC was observed in the cytoplasm and HMGB1 was located in the nucleus. cPKC began to be observed in the nuclei from 5 min after LPS treatment and the nuclear cPKC level peaked at 20 min. Then, the nuclear cPKC level decreased and eventually reached the baseline or lower at 2 h after LPS treatment. At 18 h, cPKC could not be nearly observed in the nucleus and was also reduced in the cytoplasm, confirming the previous report of down-regulation of activated PKC after stimulation (37). At 18 h, typical secretory HMGB1 granules were clearly observed in the cytoplasm after translocation (Fig. 5⇓A). The mean fluorescence intensity of nuclear cPKC is shown in Fig. 5⇓B. cPKC migration into the nucleus in RAW264.7 cells after LPS treatment. A and B, RAW264.7 cells were treated with 1 μg/ml LPS and cultured for the indicated time. The cells were fixed and observed by confocal microscopy after staining with anti-cPKC and anti-HMGB1 Abs. All immunofluorescent staining was performed at the same time. Bar, 5 μm. The mean fluorescence intensity (MFI) of >10 nuclei was measured for cPKC. C, RAW264.7 cells were treated with 1 μg/ml LPS for the indicated time. Nuclear extracts were harvested and immunoprecipitated with anti-HMGB1 Ab and protein G-Sepharose for Western blot analysis. The membrane was immunoblotted with anti-PKCα and anti-PKCγ Abs and reblotted with anti-HMGB1 Ab. To observe whether the translocated cPKC directly interacts with HMGB1 protein in the nucleus upon LPS stimulation, nuclear extract was isolated from LPS-treated RAW264.7 cells and immunoprecipitated with anti-HMGB1 for immunoblotting. When the membrane was blotted with anti-PKCα and anti-PKCγ, each PKC isoenzyme could be observed 20 min after LPS treatment (Fig. 5⇑C). We next measured the change of cPKC activity in the nucleus before and after LPS treatment. For this, cPKC was purified by the immunoprecipitation method from the nuclei of RAW264.7 cells that were treated with medium or LPS for 20 min. HMGB1 phosphorylation by nuclear cPKC purified from LPS-treated cells was ∼50% higher than that of the medium-treated control. The radioactivity was significantly reduced in the presence of Gö6976 (Fig. 6⇓A). We next measured whether the PKC inhibitor impairs HMGB1 phosphorylation and HMGB1 translocation to the nucleus in RAW264.7 cells. RAW264.7 cells were treated with LPS in the presence or absence of Gö6983. LPS-stimulated HMGB1 phosphorylation was reduced by Gö6983 in Western blot analysis using whole cell lysates (Fig. 6⇓B, upper). The migration of nuclear HMGB1 to the cytoplasm was also impaired by Gö6983 (Fig. 6⇓B, lower). 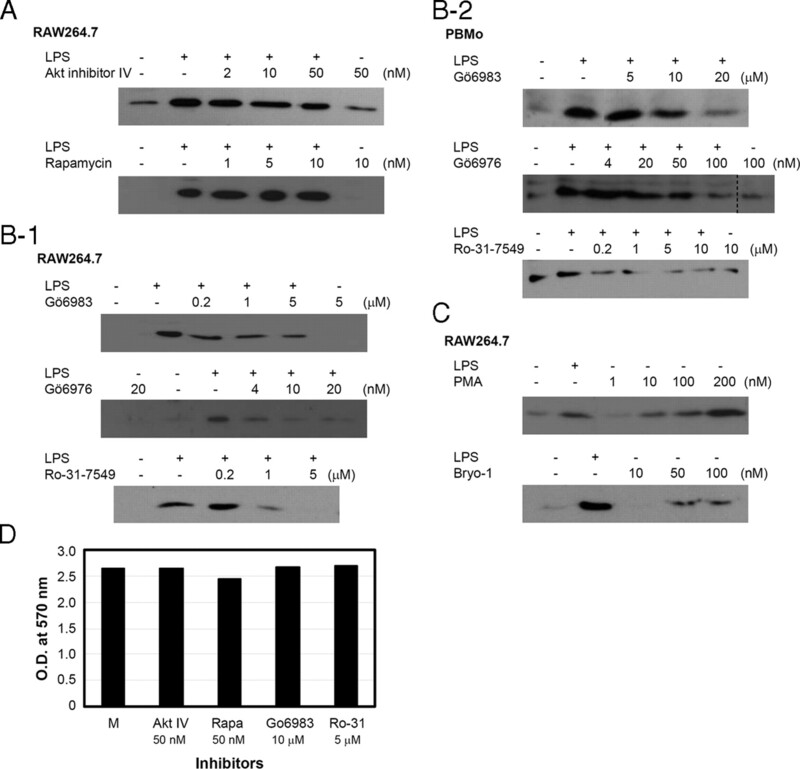 PKC inhibition reduces LPS-induced HMGB1 phosphorylation and its migration to the cytoplasm in RAW264.7 cells. A, RAW264.7 cells were treated with medium or LPS for 20 min and cPKC from the nuclear fraction was purified with an immunoprecipitation method using anti-cPKC mAb for the in vitro kinase assay of HMGB1. Levels of HMGB1 phosphorylation were measured with a beta scintillation counter. Gö6976 was added at a concentration of 10 μM to inhibit cPKC activity. Western blot analysis for the purity of the nuclear fraction was performed using anti-α-tubulin Ab. B, RAW264.7 cells were treated with LPS in the presence or absence of 5 μM Gö6983 for 16 h in duplicate and whole cell lysates were immunoprecipitated with anti-HMGB1 Ab. The membrane was immunoblotted with anti-pSer Ab and reblotted with anti-HMGB1 Ab. To observe the impairment of HMGB1 translocation, RAW264.7 cells were pretreated with 5 μM Gö6983 for 1 h and then treated with LPS for 16 h. Nuclear and cytoplasmic fractions were prepared and HMGB1 was detected by Western blot analysis using anti-HMGB1 Ab. cPKC has three isoenzymes of α, β (βI and βII), and γ. We next investigated each isoenzyme activity of cPKC for HMGB1 phosphorylation. An in vitro kinase assay of HMGB1 was performed using a same amount of recombinant PKCα, β, and γ. PKCα was the main kinase of HMGB1 and the activities of PKCβ and PKCγ for HMGB1 phosphorylation were ∼13 and ∼70% of PKCα, respectively (Fig. 7⇓A). Then, each PKCα, β, and γ was purified from the same amount of whole cell lysate of RAW264.7 cells by immunoprecipitation to investigate which isoenzyme is involved in HMGB1 phosphorylation in RAW264.7 cells. As shown in Fig. 7⇓B, PKCα was the main kinase of HMGB1 in RAW264.7 cells and both PKCβ and PKCγ, which were similarly ∼58% of PKCα activity, were also involved. 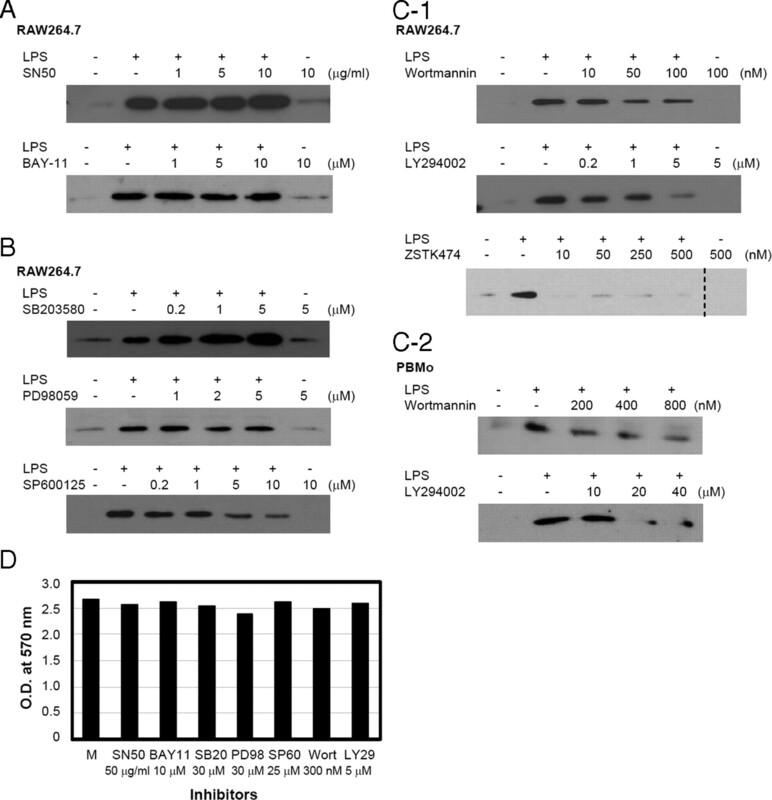 PKCα, β, and γ isoenzymes could be detected in RAW264.7 cells by Western blot analysis after immunoprecipitation (Fig. 7⇓C). These results show that HMGB1 is phosphorylated by cPKC in the nucleus after LPS treatment and translocated to the cytoplasm. Involvement of PKCα, β, and γ isoenzymes in HMGB1 phosphorylation. A, An in vitro kinase assay was performed using 2 μg of HMGB1 and 60 ng of each PKC isoenzyme as described in Materials and Methods. Levels of HMGB1 phosphorylation were measured with a beta scintillation counter. B, One microgram of each mAb to PKCα, PKCβ, and PKCγ was incubated with 3 mg of whole cell lysate protein of RAW264.7 cells for 2 h at 4°C and then immunoprecipitated with protein G-Sepharose for an in vitro kinase assay. Two micrograms of HMGB1 protein was added to each reaction and the phosphorylation level was measured. C, Equal amounts of whole cell lysates of RAW264.7 cells were immunoprecipitated with anti-PKCα, anti-PKCβ, and anti-PKCγ Abs, and Western blot analysis was performed. We examined the involvement of calcium signaling in HMGB1 secretion because cPKC activity is Ca2+ dependent. To observe whether Ca2+ is involved in HMGB1 secretion, RAW264.7 cells were treated with the Ca2+ ionophore A23187 for 30 min without LPS treatment and then the A23187 was removed by washing and the cells were maintained for subsequent measurements. We found that the HMGB1 secretion was highly increased (Fig. 8⇓A). When human PBMo cells were treated with A23187, the secretion of HMGB1 almost reached its peak level at just 6 h after treatment (Fig. 8⇓A), not necrotic cells (Fig. 8⇓D). Next, we pretreated RAW264.7 with BAPTA-AM and EGTA and then cultured the cells in the presence of LPS for another 20 h. BAPTA-AM is known to trap intracellular Ca2+ and inactivate cPKC (44, 45). Secretion of HMGB1 in RAW264.7 cells was inhibited by BAPTA-AM in a dose-dependent manner and similar results were observed in human PBMo cells (Fig. 8⇓B). Next, RAW264.7 cells were pretreated with BAPTA-AM and EGTA for 30 min and then with LPS for 16 h to observe whether BAPTA-AM and EGTA impair HMGB1 phosphorylation and HMGB1 translocation to the nucleus in RAW264.7 cells. LPS-stimulated HMGB1 phosphorylation was reduced by BAPTA-AM and EGTA (Fig. 8⇓C, upper) and the translocation of nuclear HMGB1 to the cytoplasm was also impaired (Fig. 8⇓C, lower). HMGB1 secretion is calcium dependent. A, RAW264.7 and human PBMo cells were treated with the Ca2+ ionophore A23187 for 30 min and further incubated for the indicated time after washing out the ionophore. HMGB1 in the culture supernatant was measured by Western blot analysis. B, RAW264.7 and human PBMo cells were pretreated with Ca2+ chelating agents BAPTA-AM and EGTA for 30 min and then treated with 1 μg/ml LPS for another 20 h. HMGB1 in the culture supernatants was measured. All of the tests were repeated at least two or three times depending on the experiment. C, RAW264.7 cells were pretreated with 5 μM BAPTA-AM and 1 mM EGTA for 30 min and then treated with 1 μg/ml LPS for another 16 h in duplicate. Whole cell lysates were immunoprecipitated with anti-HMGB1 Ab. The membrane was immunoblotted with anti-pSer Ab and reblotted with anti-HMGB1 Ab. To observe the impairment of HMGB1 translocation, nuclear and cytoplasmic fractions were prepared and HMGB1 was detected by Western blot analysis using the anti-HMGB1 Ab. D, MTT assay was performed at the maximum treatment concentration of each inhibitor using RAW264.7 cells. HMGB1 phosphorylation is an important mechanism that redirects HMGB1 for secretion (7); however, the effector kinase has not been previously identified. In this study, we have made the novel finding that PKC, and not CK II or cdc2, is the effector kinase for HMGB1 phosphorylation. A well-known HMG family protein, HMG-I(Y), can be phosphorylated by CK II (43, 46), cdc2 (41, 42), and PKC (40). It appears that the kinases that phosphorylate proteins in the HMG family are protein specific. PKC is not a single entity, but is a family of isoenzymes composed of three groups: cPKC, nPKC, and atypical PKC. In a secretion inhibition assay, cPKC inhibitors Gö6976 and Ro-31-7549 reduce LPS-stimulated HMGB1 secretion and the activators of cPKC and nPKC, PMA and bryostatin-1, increase HMGB1 secretion. In addition, cPKC directly phosphorylates HMGB1 in an in vitro kinase assay. 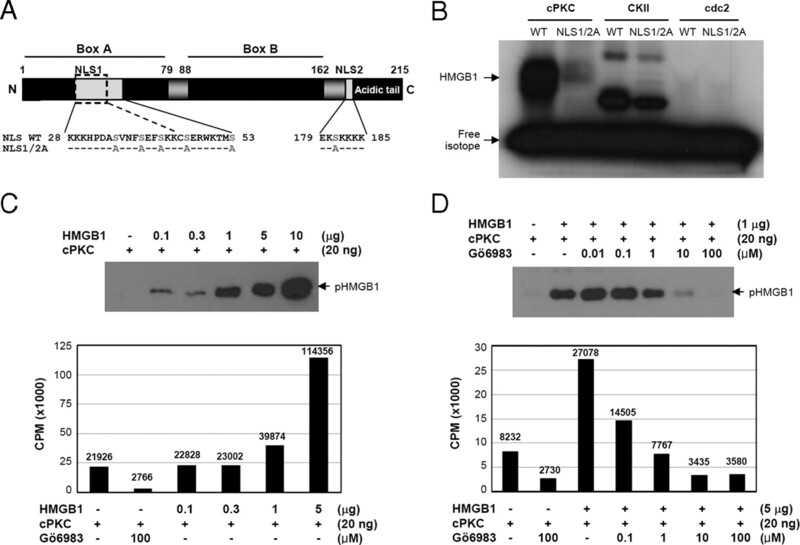 These data strongly suggest that cPKC is an effector kinase for HMGB1 phosphorylation. Since cPKC does not have a nuclear localization signal sequence (20, 21), it was unclear how it phosphorylates HMGB1 in the nucleus. A confocal microscopy study of cPKC in the nucleus after LPS stimuli and an in vitro kinase assay and immunoprecipitation analysis using purified nuclear cPKC from LPS-treated RAW264.7 cells showed that cPKC can migrate into the nucleus and bind to HMGB1 after LPS stimuli to phosphorylate HMGB1 protein with an unknown mechanism. PKC isoenzymes are located in the cytoplasm as an inactive state in resting cells and are redistributed after stimuli (20, 21), and the redistribution of PKCα and PKCγ to the nucleus after PMA stimuli or hypoxic stress had been suggested in previous reports (47, 48). PDK1 is the downstream target of PI3K (18) and in turn regulates Akt and PKCα, β, δ, ε, and ζ (18, 19). In our study, PKC phosphorylation in response to LPS stimulation was inhibited by PDK1 knockdown as shown in previous reports (18, 39). Also, LPS-stimulated HMGB1 secretion decreased after treatment with PDK1 inhibition, but not after treatment with the inhibitors of Akt and mTOR, suggesting that the PI3K-PDK1-PKC signal pathway is important for HMGB1 secretion. Of the major signaling pathways of NF-κB and MAPKs p38, ERK, and JNK in LPS-stimulated inflammation, only JNK inhibition by SP600125 reduced HMGB1 secretion, whereas we found that the other pathways had no effect on LPS-mediated HMGB1 secretion. This finding confirms previous results (29, 30), but the effect of NF-κB on HMGB1 secretion is still controversial (29, 49). Although JNK inhibition reduced LPS-stimulated HMGB1 secretion in our study and in another group study (30), it is questionable whether the reduction of HMGB1 secretion is the direct effect of JNK inhibition or the indirect effect of high concentrations of the JNK inhibitor SP600125 on cPKC activity (50). SP600125 could inhibit JNK activity at a low concentration (IC50, 0.04 μM) with a greater selectivity against MAPKs p38 and ERK. At the higher concentration, however, SP600125 could inhibit PKCα (IC50, 1.5 μM) and a PKC mix (IC50, >10 μM) (50) when used at the same concentration generally used for a JNK inhibition study. In our study, a low concentration of SP600125 under 1 μM showed little effect on LPS-mediated HMGB1 secretion but a high concentration of SP600125 over 1 μM showed the reduction of HMGB1 secretion dose-dependently. Further study of the JNK effect on HMGB1 phosphorylation and its secretion is necessary to reach a clear conclusion. cPKC levels rapidly increased in the nucleus around 20 min after LPS stimulation and then seemed to reach normal levels after 1–2 h. It is unknown why HMGB1 is translocated to the cytoplasm several hours after its phosphorylation. In the study of phosphorylation kinetics of plant maize and Arabidopsis HMGB1 proteins, which are phosphorylated by CK IIα in vitro, the phosphorylation of HMGB proteins are slow and the serial events and double phosphorylation are not yet completed after 60 min, suggesting that the rate of the phosphorylation reaction is related to the ease of interaction between CK IIα and HMGB proteins (51). After phosphorylation of HMGB1, its DNA-binding affinity is strongly decreased (40) and then it binds to nuclear exportin, CRM1, for migration to the cytoplasm (5). Considering that the simultaneous phosphorylation of HMGB1 at both NLS sites is important for its cytoplasmic relocation (7), the slow rate of HMGB1 phosphorylation may be the reason for its slow relocation to the cytoplasm. Further kinetic studies of HMGB1 phosphorylation are necessary for a more exact explanation. HMGB1 secretion is closely correlated with intracellular Ca2+ level, and this finding is not surprising given that cPKC is a calcium-dependent kinase. In a study of a liver ischemia model, HMGB1 release was induced by TLR4-dependent reactive oxygen species production in hepatocytes, and this hypoxia-induced HMGB1 release was reduced by calcium chelation (52). Recently, Zhang et al. (53) showed that inhibition of calmodulin (CaM) kinase IV (CaMKIV) reduces nucleocytoplasmic shuttling of HMGB1 and the release of HMGB1 into the culture supernatant in response to LPS, suggesting CaMKIV-dependent serine phosphorylation of HMGB1 (53). CaMKIV is a family member of CaMKs, which are serine/threonine kinases that are activated by Ca2+/calmodulin. In our study, however, the inhibitions of CaMKs with KN-93 and of CaMK kinases with STO-609 showed almost no change in LPS-stimulated HMGB1 secretion using RAW264.7 cells (data not shown), and further study is necessary for the clear conclusion. In our study, we primarily focused on cPKC, although PKCδ, ε, and ζ are activated in macrophages and monocytes stimulated with LPS (54, 55, 56), because the cPKC inhibitors were effective in inhibiting LPS-stimulated HMGB1 secretion and cPKC was the effector kinase in the in vitro kinase assay. 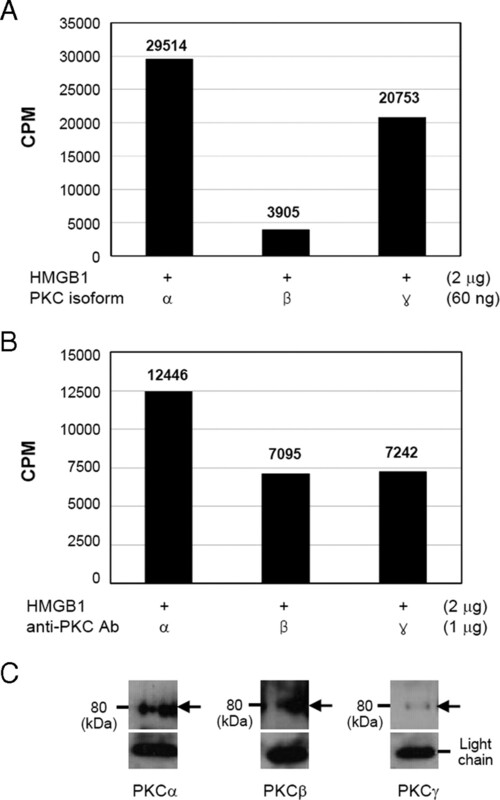 Each isoenzyme of cPKC shows a kinase activity for HMGB1 phosphorylation and further study about the involvement of PKCδ, ε, and ζ is necessary. In conclusion, LPS-stimulated HMGB1 secretion in monocytes is primarily mediated by cPKC in a calcium-dependent manner and the PI3K-PDK1 signaling pathway may act in concert to control HMGB1 secretion independent of the NF-κB, p38, and ERK pathways. The authors have no financial conflict of interest. 1 This work was supported by the Korean Health 21 Research & Development Project (A050260) of the Ministry of Health & Welfare, a Korea Research Foundation grant funded by the Korean government (MOEHRD) (KRF-E00154), a KOSEF grant through the NCRC for Nanomedical Technology (R15-2004-024-00000-0), and a grant (F104AB010006-07A0201-00610) from the Korea Biotech Research & Development Group of the Next-Generation Growth Engine Project of the Ministry of Education, Science and Technology and the Brain Korea 21 Project for Medical Sciences, Republic of Korea. 2 Y.J.O. and J.H.Y. contributed equally. 4 Abbreviations used in this paper: HMGB1, high-mobility group box 1 protein; CaM, calmodulin; CaMK, CaM kinase; CK II, casein kinase II; DAG, diacylglycerol; PBMo, peripheral blood monocyte; PDK1, phosphoinositide-dependent kinase 1; PKC, protein kinase C; cPKC, classical PKC; nPKC, novel PKC; pSer, phospho-Ser; NLS, nuclear localization signal; WT, wild type; RT, room temperature; mTOR, mammalian target of rapamycin; BAY-11, BAY 11-7082. Scaffidi, P., T. Misteli, M. E. Bianchi. 2002. Release of chromatin protein HMGB1 by necrotic cells triggers inflammation. Nature 418: 191-195. Wang, H., O. Bloom, M. Zhang, J. M. Vishnubhakat, M. Ombrellino, J. Che, A. Frazier, H. Yang, S. Ivanova, L. Borovikova, et al 1999. HMG-1 as a late mediator of endotoxin lethality in mice. Science 285: 248-251. Youn, J. H., Y. J. Oh, E. S. Kim, J. E. Choi, J. S. Shin. 2008. High mobility group box 1 protein binding to lipopolysaccharide facilitates transfer of lipopolysaccharide to CD14 and enhances lipopolysaccharide-mediated TNF-α production in human monocytes. J. Immunol. 180: 5067-5074. Sha, Y., J. Zmijewski, Z. Xu, E. Abraham. 2008. HMGB1 develops enhanced proinflammatory activity by binding to cytokines. J. Immunol. 180: 2531-2537. Bonaldi, T., F. Talamo, P. Scaffidi, D. Ferrera, A. Porto, A. Bachi, A. Rubartelli, A. Agresti, M. E. Bianchi. 2003. Monocytic cells hyperacetylate chromatin protein HMGB1 to redirect it towards secretion. EMBO J. 22: 5551-5560. Andersson, U., H. Wang, K. Palmblad, A. C. Aveberger, O. Bloom, H. Erlandsson-Harris, A. Janson, R. Kokkola, M. Zhang, H. Yang, K. J. Tracey. 2000. High mobility group 1 protein (HMG-1) stimulates proinflammatory cytokine synthesis in human monocytes. J. Exp. Med. 192: 565-570. Youn, J. H., J. S. Shin. 2006. Nucleocytoplasmic shuttling of HMGB1 is regulated by phosphorylation that redirects it toward secretion. J. Immunol. 177: 7889-7897. Tobias, P. S., J. C. Mathison, R. J. Ulevitch. 1988. A family of lipopolysaccharide binding proteins involved in responses to gram-negative sepsis. J. Biol. Chem. 263: 13479-13481. Van Amersfoort, E. S., T. J. Van Berkel, J. Kuiper. 2003. Receptors, mediators, and mechanisms involved in bacterial sepsis and septic shock. Clin. Microbiol. Rev. 16: 379-414. Beutler, B., E. T. Rietschel. 2003. Innate immune sensing and its roots: the story of endotoxin. Nat. Rev. Immunol. 3: 169-176. Miyake, K.. 2004. Innate recognition of lipopolysaccharide by Toll-like receptor 4-MD-2. Trends Microbiol. 12: 186-192. Guha, M., N. Mackman. 2002. The phosphatidylinositol 3-kinase-Akt pathway limits lipopolysaccharide activation of signaling pathways and expression of inflammatory mediators in human monocytic cells. J. Biol. Chem. 277: 32124-32132. Kuo, C. C., W. T. Lin, C. M. Liang, S. M. Liang. 2006. Class I and III phosphatidylinositol 3′-kinase play distinct roles in TLR signaling pathway. J. Immunol. 176: 5943-5949. Ojaniemi, M., V. Glumoff, K. Harju, M. Liljeroos, K. Vuori, M. Hallman. 2003. Phosphatidylinositol 3-kinase is involved in Toll-like receptor 4-mediated cytokine expression in mouse macrophages. Eur. J. Immunol. 33: 597-605. Alessi, D. R., S. R. James, C. P. Downes, A. B. Holmes, P. R. Gaffney, C. B. Reese, P. Cohen. 1997. Characterization of a 3-phosphoinositide-dependent protein kinase which phosphorylates and activates protein kinase Bα. Curr. Biol. 7: 261-269. Stephens, L., K. Anderson, D. Stokoe, H. Erdjument-Bromage, G. F. Painter, A. B. Holmes, P. R. Gaffney, C. B. Reese, F. McCormick, P. Tempst, et al 1998. Protein kinase B kinases that mediate phosphatidylinositol 3,4,5-trisphosphate-dependent activation of protein kinase B. Science 279: 710-714. Pullen, N., P. B. Dennis, M. Andjelkovic, A. Dufner, S. C. Kozma, B. A. Hemmings, G. Thomas. 1998. 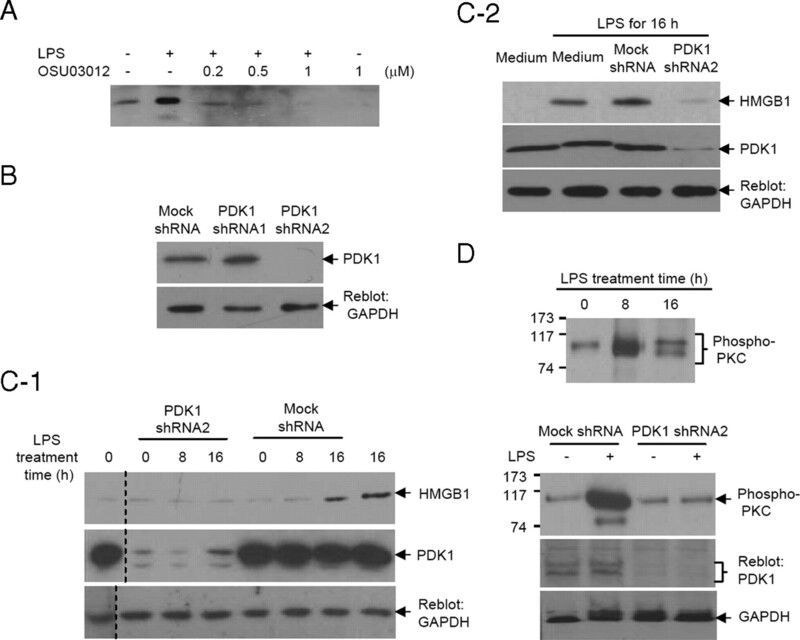 Phosphorylation and activation of p70s6k by PDK1. Science 279: 707-710. Le Good, J. A., W. H. Ziegler, D. B. Parekh, D. R. Alessi, P. Cohen, P. J. Parker. 1998. Protein kinase C isotypes controlled by phosphoinositide 3-kinase through the protein kinase PDK1. Science 281: 2042-2045. Chou, M. M., W. Hou, J. Johnson, L. K. Graham, M. H. Lee, C. S. Chen, A. C. Newton, B. S. Schaffhausen, A. Toker. 1998. Regulation of protein kinase Cζ by PI 3-kinase and PDK-1. Curr. Biol. 8: 1069-1077. Newton, A. C.. 2003. Regulation of the ABC kinases by phosphorylation: protein kinase C as a paradigm. Biochem. J. 370: 361-371. Spitaler, M., D. A. Cantrell. 2004. Protein kinase C and beyond. Nat. Immunol. 5: 785-790. Gschwendt, M., S. Dieterich, J. Rennecke, W. Kittstein, H. J. Mueller, F. J. Johannes. 1996. Inhibition of protein kinase C μ by various inhibitors: differentiation from protein kinase C isoenzymes. FEBS Lett. 392: 77-80. Martiny-Baron, G., M. G. Kazanietz, H. Mischak, P. M. Blumberg, G. Kochs, H. Hug, D. Marme, C. Schachtele. 1993. Selective inhibition of protein kinase C isozymes by the indolocarbazole Go 6976. J. Biol. Chem. 268: 9194-9197. Wilkinson, S. E., P. J. Parker, J. S. Nixon. 1993. Isoenzyme specificity of bisindolylmaleimides, selective inhibitors of protein kinase C. Biochem. J. 294: 335-337. Yaguchi, S., Y. Fukui, I. Koshimizu, H. Yoshimi, T. Matsuno, H. Gouda, S. Hirono, K. Yamazaki, T. Yamori. 2006. Antitumor activity of ZSTK474, a new phosphatidylinositol 3-kinase inhibitor. J. Natl. Cancer Inst. 98: 545-556. Szallasi, Z., C. B. Smith, G. R. Pettit, P. M. Blumberg. 1994. Differential regulation of protein kinase C isozymes by bryostatin 1 and phorbol 12-myristate 13-acetate in NIH 3T3 fibroblasts. J. Biol. Chem. 269: 2118-2124. Mackay, H. J., C. J. Twelves. 2007. Targeting the protein kinase C family: are we there yet?. Nat. Rev. Cancer 7: 554-562. Liang, K., Y. Lu, X. Li, X. Zeng, R. I. Glazer, G. B. Mills, Z. Fan. 2006. Differential roles of phosphoinositide-dependent protein kinase-1 and akt1 expression and phosphorylation in breast cancer cell resistance to paclitaxel, doxorubicin, and gemcitabine. Mol. Pharmacol. 70: 1045-1052. Killeen, M. E., J. A. Englert, D. B. Stolz, M. Song, Y. Han, R. L. Delude, J. A. Kellum, M. P. Fink. 2006. The phase 2 enzyme inducers ethacrynic acid, dl-sulforaphane, and oltipraz inhibit lipopolysaccharide-induced high-mobility group box 1 secretion by RAW 264.7 cells. J. Pharmacol. Exp. Ther. 316: 1070-1079. Jiang, W., D. S. Pisetsky. 2006. The role of IFN-α and nitric oxide in the release of HMGB1 by RAW 264.7 cells stimulated with polyinosinic-polycytidylic acid or lipopolysaccharide. J. Immunol. 177: 3337-3343. Herrera-Velit, P., N. E. Reiner. 1996. Bacterial lipopolysaccharide induces the association and coordinate activation of p53/56lyn and phosphatidylinositol 3-kinase in human monocytes. J. Immunol. 156: 1157-1165. Weinstein, S. L., A. J. Finn, S. H. Dave, F. Meng, C. A. Lowell, J. S. Sanghera, A. L. DeFranco. 2000. Phosphatidylinositol 3-kinase and mTOR mediate lipopolysaccharide-stimulated nitric oxide production in macrophages via interferon-β. J. Leukocyte Biol. 67: 405-414. Brown, E. J., P. A. Beal, C. T. Keith, J. Chen, T. B. Shin, S. L. Schreiber. 1995. Control of p70 s6 kinase by kinase activity of FRAP in vivo. Nature 377: 441-446. Brunn, G. J., C. C. Hudson, A. Sekulic, J. M. Williams, H. Hosoi, P. J. Houghton, J. C. Lawrence, Jr, R. T. Abraham. 1997. Phosphorylation of the translational repressor PHAS-I by the mammalian target of rapamycin. Science 277: 99-101. Kikkawa, U., Y. Takai, Y. Tanaka, R. Miyake, Y. Nishizuka. 1983. Protein kinase C as a possible receptor protein of tumor-promoting phorbol esters. J. Biol. Chem. 258: 11442-11445. Trenn, G., G. R. Pettit, H. Takayama, J. Hu-Li, M. V. Sitkovsky. 1988. Immunomodulating properties of a novel series of protein kinase C activators: the bryostatins. J. Immunol. 140: 433-439. Isakov, N., D. Galron, T. Mustelin, G. R. Pettit, A. Altman. 1993. Inhibition of phorbol ester-induced T cell proliferation by bryostatin is associated with rapid degradation of protein kinase C. J. Immunol. 150: 1195-1204. Rabah, D., S. Grant, C. Ma, D. H. Conrad. 2001. Bryostatin-1 specifically inhibits in vitro IgE synthesis. J. Immunol. 167: 4910-4918. Balendran, A., G. R. Hare, A. Kieloch, M. R. Williams, D. R. Alessi. 2000. Further evidence that 3-phosphoinositide-dependent protein kinase-1 (PDK1) is required for the stability and phosphorylation of protein kinase C (PKC) isoforms. FEBS Lett. 484: 217-223. Xiao, D. M., J. H. Pak, X. Wang, T. Sato, F. L. Huang, H. C. Chen, K. P. Huang. 2000. Phosphorylation of HMG-I by protein kinase C attenuates its binding affinity to the promoter regions of protein kinase C γ and neurogranin/RC3 genes. J. Neurochem. 74: 392-399. Nissen, M. S., T. A. Langan, R. Reeves. 1991. Phosphorylation by cdc2 kinase modulates DNA binding activity of high mobility group I nonhistone chromatin protein. J. Biol. Chem. 266: 19945-19952. Reeves, R., T. A. Langan, M. S. Nissen. 1991. Phosphorylation of the DNA-binding domain of nonhistone high-mobility group I protein by cdc2 kinase: reduction of binding affinity. Proc. Natl. Acad. Sci. USA 88: 1671-1675. Palvimo, J., A. Linnala-Kankkunen. 1989. Identification of sites on chromosomal protein HMG-I phosphorylated by casein kinase II. FEBS Lett. 257: 101-104. Dieter, P., E. Fitzke, J. Duyster. 1993. BAPTA induces a decrease of intracellular free calcium and a translocation and inactivation of protein kinase C in macrophages. Biol. Chem. Hoppe-Seyler 374: 171-174. Zhou, X., W. Yang, J. Li. 2006. Ca2+- and protein kinase C-dependent signaling pathway for nuclear factor-κB activation, inducible nitric-oxide synthase expression, and tumor necrosis factor-α production in lipopolysaccharide-stimulated rat peritoneal macrophages. J. Biol. Chem. 281: 31337-31347. Wang, D. Z., P. Ray, M. Boothby. 1995. Interleukin 4-inducible phosphorylation of HMG-I(Y) is inhibited by rapamycin. J. Biol. Chem. 270: 22924-22932. Leach, K. L., E. A. Powers, V. A. Ruff, S. Jaken, S. Kaufmann. 1989. Type 3 protein kinase C localization to the nuclear envelope of phorbol ester-treated NIH 3T3 cells. J. Cell Biol. 109: 685-695. Huang, H. M., C. H. Weng, S. C. Ou, T. Hwang. 1999. Selective subcellular redistributions of protein kinase C isoforms by chemical hypoxia. J. Neurosci. Res. 56: 668-678. Wang, H., H. Liao, M. Ochani, M. Justiniani, X. Lin, L. Yang, Y. Al-Abed, H. Wang, C. Metz, E. J. Miller, K. J. Tracey, L. Ulloa. 2004. Cholinergic agonists inhibit HMGB1 release and improve survival in experimental sepsis. Nat. Med. 10: 1216-1221. Bennett, B. L., D. T. Sasaki, B. W. Murray, E. C. O'Leary, S. T. Sakata, W. Xu, J. C. Leisten, A. Motiwala, S. Pierce, Y. Satoh, et al 2001. SP600125, an anthrapyrazolone inhibitor of Jun N-terminal kinase. Proc. Natl. Acad. Sci. USA 98: 13681-13686. Stemmer, C., D. J. Leeming, L. Franssen, R. Grimm, K. D. Grasser. 2003. Phosphorylation of maize and Arabidopsis HMGB proteins by protein kinase CK2α. Biochemistry 42: 3503-3508. Tsung, A., J. R. Klune, X. Zhang, G. Jeyabalan, Z. Cao, X. Peng, D. B. Stolz, D. A. Geller, M. R. Rosengart, T. R. Billiar. 2007. HMGB1 release induced by liver ischemia involves Toll-like receptor 4 dependent reactive oxygen species production and calcium-mediated signaling. J. Exp. Med. 204: 2913-2923. Zhang, X., D. Wheeler, Y. Tang, L. Guo, R. A. Shapiro, T. J. Ribar, A. R. Means, T. R. Billiar, D. C. Angus, M. R. Rosengart. 2008. 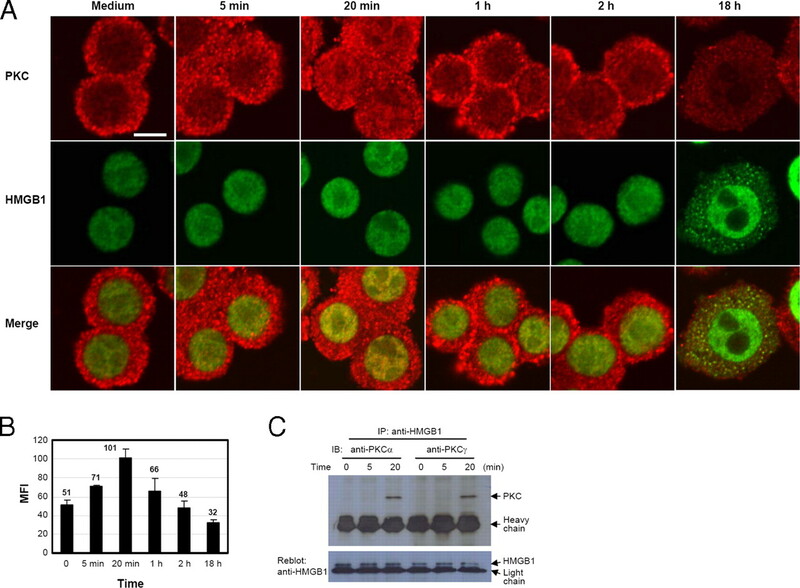 Calcium/calmodulin-dependent protein kinase (CaMK) IV mediates nucleocytoplasmic shuttling and release of HMGB1 during lipopolysaccharide stimulation of macrophages. J. Immunol. 181: 5015-5023. Castrillo, A., D. J. Pennington, F. Otto, P. J. Parker, M. J. Owen, L. Bosca. 2001. Protein kinase Cε is required for macrophage activation and defense against bacterial infection. J. Exp. Med. 194: 1231-1242. Chen, C. C., J. K. Wang, S. B. Lin. 1998. Antisense oligonucleotides targeting protein kinase C-α, -βI, or -δ but not -ε inhibit lipopolysaccharide-induced nitric oxide synthase expression in RAW 264.7 macrophages: involvement of a nuclear factor κB-dependent mechanism. J. Immunol. 161: 6206-6214. Herrera-Velit, P., K. L. Knutson, N. E. Reiner. 1997. Phosphatidylinositol 3-kinase-dependent activation of protein kinase C-ζ in bacterial lipopolysaccharide-treated human monocytes. J. Biol. Chem. 272: 16445-16452.